BBC NEWS | UK | UK Politics | Have Your Say | Can Blair's new team deliver? Prime Minister Tony Blair has reshuffled the Cabinet following his party's historic third election victory. David Blunkett has returned as work and pensions secretary, Patricia Hewitt has taken over health from John Reid, who has moved to defence while Geoff Hoon has become Commons leader. The Conservatives gained several target seats on large swings from Labour and the Lib Dems also took key seats. What is your reaction to the Cabinet reshuffle? What should be the new Labour government's priority? Does Mr Blair think we all have a short-term memory? Recycling ex-cabinet ministers instead of injecting new blood into his Cabinet seems odd to me. Time was, if you made a mistake, your career was finished. Are we becoming more tolerant? Someone should ask Tony what he heard when he started listening to the people. He obviously didn't learn anything from the process because he is still doing just what he wants regardless of the opinions of others. His cabinet reshuffle will only make the rebel MPs more determined to oust him. Tony Blair has consistently proved to be the greatest leader Labour has ever seen. It does amuse me though that old socialist stalwarts still believe we can return to beer and sandwiches at Number 10 with the TUC. When will they realise that Labour can return to opposition forever, based on this principle. Long live Tony - he's got the Tories trying to reform again and we've still got Labour dinosaurs crying for his head. Let's hope he can achieve success; even though I'm not a great fan of Mr Blair. If he fails then the mounting costs involved in keeping troops in Iraq will cripple the economy and the pre-election coverage on Iraq will return to haunt him yet again. How can they deliver? They are the same ineffectual lot as before. Everything ends up being a power struggle between Brown and Blair, changing the team won't change the chaos-like government policy. To us in India, it was a shock that even after the public outpouring of anger over Iraq, Tony Blair is back. The Labour government should see to it that UK's chairmanship of the G8 should be used to promote the welfare of Africans through the promotion of good governance and betterment of the livelihood of the average African. I don't think Blair will deliver. His party will now be consumed by in-fighting which will lead to inertia and electoral disaster. It's a re-run of the Major years. Depends on what you mean deliver. If you mean saddle the majority who didn't vote for him with the wishes of the minority who did then he may go some way. If you mean will he take on board the 'lesson' that a small minority and a non-democratic system got him more power then the answer is no. Take as an example the fact that David Blunkett is once more in the cabinet having had to resign in disgrace only a few months back. So much for listening is all I can say. If the team can see pass the targets, initiatives and quangos, then they might see what actually needs to be done. First thing to do is to shut Tony's door, so that you cannot hear "I'm listening", then tackle the real concerns that people want to see action on - like being safe on the streets, etc. Tony Blair is not capable of learning from his mistakes or listening to people who have differing opinions. He has set up a team of yes men and women and will continue on in his usual arrogant, head in the clouds way as long as they keep saying yes. The best thing Tony Blair has ever done is put David Blunkett back into the team. He's the only politician I know who will stand up for what he believes and this is usually what the vast majority of the population believe too. Maybe he should be the next prime minister. I am not a supporter of Labour or Tony Blair. But it's obvious the election victory, had the full support of the majority of British people. Who are obviously happy with New Labour and its policies. People get what they vote for, and hopefully the new government, can deliver on the majority of its promises. Labour and the finest British PM ever Tony Blair will deliver all right. That is why they have been convincingly re-elected for a historic third term. I know that a lot of comments reflect the sour grapes the Tories feel after being rejected yet again by the sensible majority. How they must yearn for the Maggie years! In a couple of years when the economy has hit rock-bottom and all the true figures of our collective debt surface, perhaps people will then wonder why they trusted him for a third term! To all those calling for Tony Blair's blood, remember what happened to the Tories, following the "night of the long knives" that ousted Margaret Thatcher. The last thing the Labour Party needs is a pyrrhic victory where all the achievements, of the last two terms, go up in a bonfire of recrimination. Having said that, all this can be avoided if Blair hands over the leadership to Gordon Brown. Blair and his government should now concentrate on serving his monarch and the people of this country rather than continuing a presidential style government. I never once voted Labour, and I was right, as they U-turned away from major issues such as British Rail re-nationalisation, proportional representation and keeping the Post Office in proper public (government) ownership/control. A fine mess you have left, PM, now clear it up in your final term of office! OK, Tony Blair may not be the most popular person in the country at the moment, but he has major decisions which are sometimes unpopular to term a phrase he "can't please all the people all the time" but by heavens look seriously at the alternatives to Labour. I shudder to think of a country led by Howard or Kennedy. Tony Blair says he will "focus relentlessly" on the public's priorities - since most of the public don't want the European Constitution or the Euro, he obviously won't be spending millions of pounds campaigning for these? To answer this question, ask yourself another question. If the economy wasn't stable (nothing directly to do with Labour) would you have voted Labour again? Any current government can get away with broken promises as long as the economy appears to be good. This lot are no different. I am as confident that Tony et al can deliver on their promises in a third term as I am that I will win the lottery. i.e. 14 million to 1 against! Blair's first priority should be to encourage a succession debate and then leave. He has been hanging on irrespective of the opinion the country has of him. If he really listens to the voice of the electorate, then he must be able to understand that the substantially reduced majority is not a sign of approval. He has stayed far longer than he should and he has insulted the electorate for far too long with his arrogance. Mr. Blair is highly respected and admired in the US while many of his party are not. It would be unfortunate for the US if he loses his job. He seems to be the only world leader with any real influence in our country and believe me, we need it. As a Labour voter I'm delighted to see the return of an historic third term Labour Government with a comfortable majority. I think we will see a more focused and, perhaps, less complacent government from now on. Lest we forget, a lot of Labour supporters would have been delighted with a majority of 60 in 1979, 1983, 1987 or 1992. A win is a win is a win. Thanks again Prime Minister Blair! Everyone thinks the Conservatives' coming leadership battle will be divisive, but look at Labour - they can't even decide when their leader should resign! By all means, carry on lads: the more you bicker about it and delay Blair's handing-over, the further behind you put yourselves in the polls for good. We'll pick up the pieces in 2009/10, even if you've managed to pull yourselves together by then. People live in the best economy since heaven knows when and they "blame" Tony Blair. Iraq was necessary. Labour has delivered in every way and will go on delivering under Tony Blair. I believe the dip in support was media led and due to the Iraq factor - nothing else. Labour spent nigh twenty years in the wilderness until Tony Blair and co. got to work. Tony and Gordon work very well indeed. Let it be. If Blunkett was unfit to hold office when he had to leave his last post, what has changed? Another case of blatant spin. Now the election is done, Blair obviously feels free to continue in his previous imperious style and bring back his cronies to tell him how great he is. Stand by for another raft of laws and policies pushed through with absolutely no regard to the opinion of the people. European referendum anyone? Not a chance! President Blair has already made up his mind, why should he bother asking us? On May 5th our great country voted for a Labour party headed by Tony Blair, not Gordon Brown or David Blunkett or John Reid - Tony Blair! To oust him now would be an insult to loyal Labour voters who look at Tony and see his fallibility but also his honesty, all that he has achieved and his very special leadership skills. 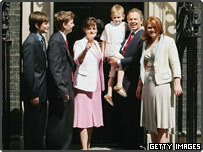 May 5th 2005 was a vote for Tony Blair, his record and his redefinition of Labour aspirations. We need to keep Tony till 2008, giving his successor a year to assert him or herself in the run up to a fourth Labour term. They will deliver all right. Higher taxes, more red tape, more impositions on personal freedom will all be delivered with alacrity. And when our economy is as bad if not worse than Europe they will deliver full European membership and the Euro. Wilson and Callaghan would have been delighted to have had a majority of 60! Good for Tony Blair who has broken the mould of a century of Conservative rule. A reduced majority? What do you expect, he has been in power for so long people start to want a change. Good luck to the Prime Minister who has given the Labour movement the chance to be in power long enough to bring about real social changes. Wilson and Callaghan would have been delighted to have had a majority of 60! If anyone can take a suitably hard line to get the pensions issue underway, it's David Blunkett! Welcome back! Can I just say that I am appalled that some arrogant Labour MPs want to get rid of Tony Blair, calling him a "liability". Labour would not be in government now were it not for Tony Blair. No matter what people may think of him -- and I do disagree with some of the things he has done -- he has made the Labour Party a palatable option. I didn't vote Labour, but I'm not unhappy they're in. It alarms me a lot when people say Britain isn't democratic - living in Russia I know what non-democracy means. We all have to appreciate and preserve the British way! I am disgusted by the return of Blunkett to the cabinet. The man was forced to resign through blatant misuse of his office and now he is back again as if nothing had happened. Top Tories have been sent to jail for less, are Labour politicians immune from wrongdoing? Congratulations to Tony Blair and his supreme team of ministers. Of course they will deliver. Tony Blair is our finest ever prime minister and i am really proud of him. Surely this all proves that the current system of so-called democracy in the UK is arcane, unrepresentative, undemocratic. Why don't we have a governing body of experts and professionals in their field who know what they are doing. This "3 party system" and the whole notion of "politics" is an impediment to our progress. What a good job Blair has done for education - produced a generation of people stupid enough to vote for him. I'm surprised he didn't bring Peter Mandelson back for a fourth time. The team can deliver. I think Blair will serve the full term. The British voters have rewarded Tony Blair for giving them the strongest economy in Europe by substantially reducing his power in Parliament in order to punish him for his decision to invade Iraq. In effect, they have punished themselves and if the slim majority is not effective in continuing the policies already proven successful, they will have no one to blame but themselves. What is the definition of the word stupid? There will come a time in the future when we look back in amazement that a political party with little more than a third of the vote can end up with a large majority in parliament. What honest defence can there be of a system where 64% of the electorate do not want the party that has overwhelming power? The team can deliver. I think Blair will serve the full term. It will be interesting to see how Defence Secretary Reid will handle his new job. But there could be one mistake: The comeback of David Blunkett. As someone who resigned just five months ago, he should now work harder. The reshuffle of a pack of jokers rarely leads to a strong suit. My bet is that Tony folds within 18 months and allows Gordon to try and patch up the mess he made by raising taxation yet higher. Only one third of us voted for it, but we will all end up paying for it. Can I request the media actually give Blair at least some time to try and deliver promised improvements? Thankfully we retain a Labour centre consensus government empowered to take the country further forward from the amoral, greedy, foundering morass left by the Conservatives. I was glad to see a strong Lib Dem vote and hope that will split the opposition for Labour, ensuring no early return to the dark, greedy days of Tory rule. I am happy to see a strong Blair government. A relief indeed. We, Czechs, wish Tony all the best in his third term and thank the British electorate for keeping such a good leader in the office. Better for Britain, better for Czechs. I was amused to hear Mr Blair state he is listening to the people now. It's a pity he did not with Iraq. Plus the measures he has announced seem remarkably similar to the Conservative agenda for the election? Is New Labour more Conservative then the Tories? He better deliver this time as his time is running out. He may not survive up to the last months of his ministry. The new Labour Government's priorities should be; more police, cleaner hospitals, lower taxes, school discipline, controlled immigration, accountability. It's not hard! The results in election 2005 clearly shows why we need to reform our political voting system. The electoral reform committee are right to say we need PR in order to save our democracy and to get ordinary folk to show interest in politics, and to vote. One in five people voted for Labour, and a 60% turnout is rather a sad reflection of our society's endorsement of our political system. We need to change now. Tony Blair says he has listened - then brings back David Blunkett after a couple of months in the sin bin for fast-tracking a visa? Give us compulsory voting and a "none of the above" box on the ballot form... quickly! Another term of tax, poor education, and pathetic health services. Well voted, England. Can I request the media actually give Blair at least some time to try and deliver promised improvements before the resumption of the age-old practise of running whoever is in power down into the ground over everything? They are here to stay for another term but the reshuffle means that Patricia Hewitt takes over one of the largest and most important government departments, she is incapable and wishy-washy when she was Trade and Industry Secretary, so why give her yet more responsibility? David Blunkett was a strong Home Secretary, he would have been ideal to head Health, meanwhile Hoon has been sidelined after hardly being seen over the past few weeks and months after the embarrassment of the War in Iraq. Let's hope Blair has listened like he said he has and that he will stand down ASAP for a new, more worthy leader. Yes, they can deliver, they were already delivering: more nurses, more doctors, more police, reduced crime, new and improved hospitals, new and improved schools, low interest rates, low inflation, high employment - why do you think they were returned to office ! Does resigning mean nothing these days? Blunkett wrongly used his position to speed up a visa application and give a rail pass to his lover and then Blair invites him back after just five months. What kind of message does this show by the new government - that it's fine to break the rules as long as you then take a few months out? If the Tories had done something similar when in government, opponents and the media would have been up in arms, but Labour just seems to get away with it. The electorate have given Blair a clear message in voting him in (as Labour were the only viable party) but with a hugely reduced majority. Now he, and/or Mr. Brown, need to listen to that message and respond with sensible policies that actually reflect the views of the electorate. We do live in a democracy after all. Every member of Blair's reshuffled Cabinet voted for an illegal attack on Iraq. It is time for the International Court to bring a war crimes prosecution against Tony Blair and his cronies, who share responsibility for the deaths of up to 100,000 Iraqis. Hoon was lucky to escape with a job at all. With interest rates rising, taxes going up and several jobs being cut in the private sector I do not see how this new team will be able to deliver. Therefore with the Conservatives getting a younger more appealing leader, Labour struck in an economic crisis and the Liberal Democrats striking European policies it is extremely likely that it will be the Conservatives turn next time. The return of Tony Blair to office by the British people is still a puzzle to me, after all the atrocities committed in Iraq. He reshuffled Cabinet to keep us expecting changes that will never come. Has nobody yet mentioned that if Scotland and Wales had been given independence, and a system of proportional representation introduced, there would have been a hung parliament with a Conservative majority? I did not vote New Labour but now they have won the election I sincerely hope that they begin to listen to the mood of the people who put them their, instead of going off on hair brained adventures leaving the people that matter behind in the dust! Without the backing of the people of the UK, come the next election it will be time for a change and four years is a very short time in politics. I was sorry to see that Blair was so quick to bring David Blunkett back and felt he would have been wiser to at least let the dust settle after the election before doing so, if at all. The thought of Labour and Tony Blair for the next four years is bad enough but do we have to suffer Blunkett again. I'll listen to the people is the first broken promise; the people have seen quite enough of Mr Blunkett thank you. Well, in choosing his cabinet and giving David Blunkett a position, Tony Blair once again thumbs his nose at the electorate, illustrating once more that what the public think doesn't even count as far as he's concerned. How can we trust this man any further? If we really must endure Labour for another four years, then at least give us a PM we can trust to listen to the public's concerns, such as Gordon Brown. Blair has consistently proven he's not the right man to lead this country. Tony has to wake up and take notice of what the people of this country want from their Government. We want to see that they are true to their convictions and are honest. At least the health service is free and safe for another four or more years. Although they have a reduced majority it still makes me sick that the population will happily vote for a man and party that will not live up to any promises and lie to us with no apologies time and time again. How can so much of the country show up as blue on the BBC map of results, yet the Labour party win so many seats? They only got 4% more votes. Obviously the fixing of the constituency boundaries during there previous terms has paid off. Is this democracy? Why are the Tories annoyed about the constituency boundaries? They got about a third of the vote and have won about a third of the seats. If anyone should be fuming, it's the Lib Dems. If I had been told 10 years ago that we would have a third term Labour government with a 66 seat majority, I would have laughed in disbelief! If the Tories can't win now they never will!